Video is important to every facet of your business - by now marketers are aware of this fact. But, video has a very special place in the sales cycle - the interactive, visual, audio-friendly content is an imperative tactic to deploy when trying to convert a prospect into a lead, then eventually, a lead into a customer. Video helps move that conversion process along. Initially, when marketers started utilizing this type of content, video was used as a top-of-the-funnel-only tool, but video's potential extends far beyond an awareness asset. When it comes down to incorporating video into an existing content strategy or creating a new video strategy entirely, video is not a one-size-fits-all solution. Different types of video perform better at different stages in the sales funnel. 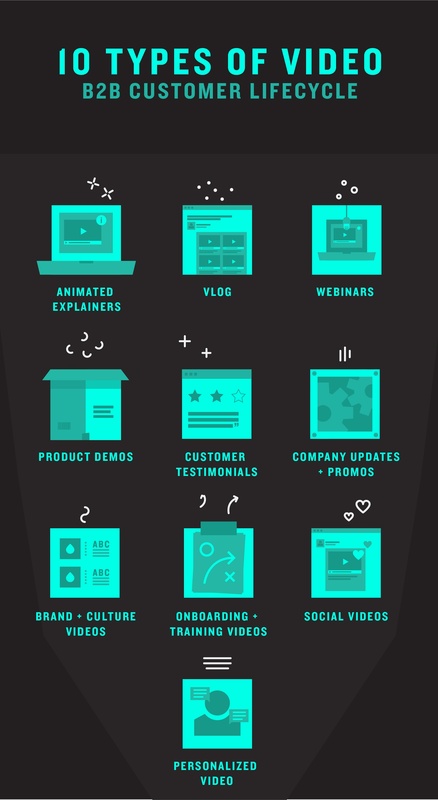 If you need recommendations for different types of video to help push your audience through the funnel, check out one of our other infographics. We've delved a little deeper into the B2B customer lifecycle, and what types of video work for different stages in the funnel. Different areas require different video features or characteristics, such as length, production level, or difficulty to attain the assets. Shoutout to Vidyard for the inspiration behind this infographic series. And to see the full infographic, click here!